The Japanese government enacted a bill Wednesday lowering the age of adulthood from 20 to 18, but teenagers beware: the legal age of drinking will stay fixed at 20. The change, the first of its kind in 142 years, will allow 18-year-olds to take out credit cards and loans, apply for a passport that's valid for 10 years as opposed to five, and marry without parental consent. Currently, men aged 18 and women aged 16 are able to marry, but must first seek parental consent. The revision to the civil code, which is due to take effect from April 1, 2022, won't alter the legal age of drinking, smoking or gambling, however, owing to health concerns. A combination of falling birth rates and improving life expectancy across Japan have resulted in a progressively shrinking, and aging population. By 2060, the country's population is expected to plummet to 86.74 million from its current total of 126.26 million, according to a projection by the Japanese Health Ministry. But fewer workers paying taxes, means less money to support a growing aging population in need of pensions and healthcare services. "Given Japan's aging society and the growing budget deficit, there's a need for the young to increase tax payments," said Jeff Kingston, Asian Studies director at Japan's Temple University. "Lowering the age of adulthood could be a way to convince them that they have a stake and voice in society," he added. In 2015, the government changed the voting age from 20 to 18. That move, coupled with Wednesday's revisions, indicate an increased attempt within the government to make young people more aware of their responsibilities. "Voting rates aren't that high in Japan so this could be a PR move by the government and a way for them to woo young people to think about their role in the political conversation," said Kingston. But observers also suggested that the move to lower the age of adulthood could have an additional political dimension. "Prime Minister Shinzo Abe wants to revise the peace constitution, but to do that he needs a majority 'yes' in a referendum," Yonaha Eiko, a researcher at Meio University in Okinawa, Japan, told CNN. Japan's hawkish prime minister, has long advocated a revision to Japan's pacifist constitution, which currently states that Japan renounces war and will not maintain air, land or sea forces for non-defensive purposes. Yonaha feared that younger adults in Japan were not mature enough to consider the political implications of their votes, and could be easily swayed by the government agenda. 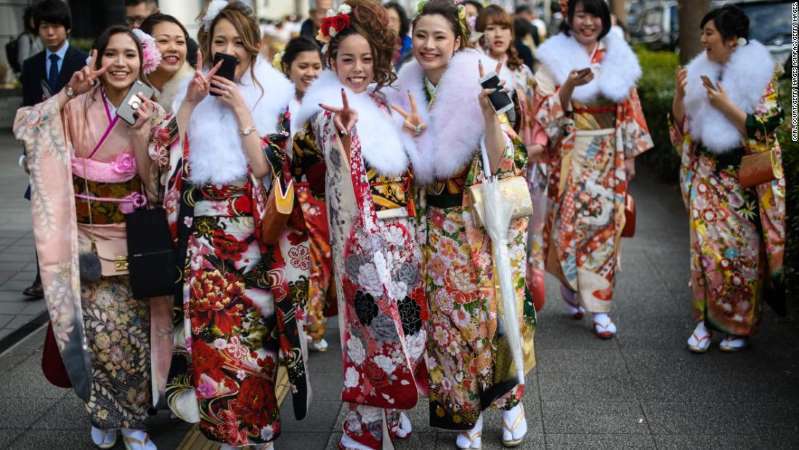 On Twitter, however, users appeared more worried by the effect the revision would have on Japan's Coming of Age Day, a holiday held in January where 20-year-olds dress up in traditional kimonos to celebrate adulthood. "Everything is so expensive when you're 18, it would be impossible to have a kimono then," one Twitter user lamented.